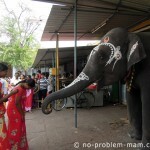 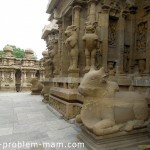 It is said that Kanchipuram gives eternal happiness to those who visit it. 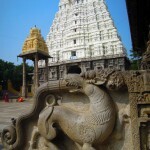 Located 65km from Madras on the banks of the river Vegavathy, Kanchipuram is known as the City of Gold or the City of a Thousand Temples. 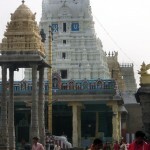 It is one of India’s seven most holy places, the Sapta Puri. 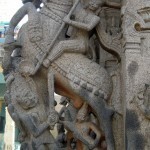 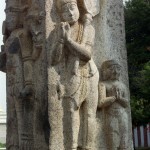 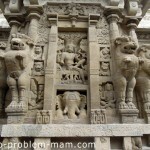 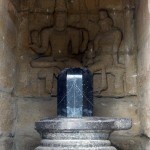 Kanchipuram was the capital of the Pallava kings from the 6th to 8th centuries. 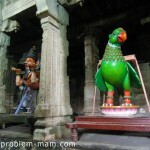 In those days it was renowned as a ghatikasthanam – a place of learning. 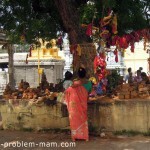 Although the town may at one time have boasted thousands of temples, today there are rather fewer than a hundred. 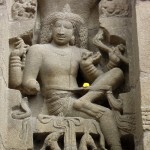 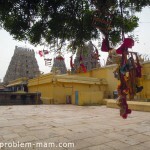 The town is divided into two main parts, Shiva-Kanchi to the north and Vishnu-Kanchi to the east. 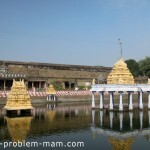 There is also a group of Jain temples to the south, across the river. 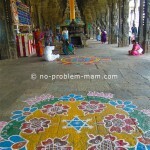 The Ekambareswara, a superb temple on the north side of town, is is the largest temple in Kanchipuram. 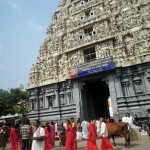 Its gopuram (entrance tower) stands nearly 60m tall, which makes it one of the tallest in India. 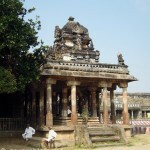 The temple’s earliest foundations date from about 600 CE; successive dynasties such as the Pallavas, Pandyas and Cholas, and later the Vijayanagar kings, all remodelled or added to the building. 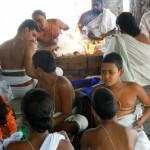 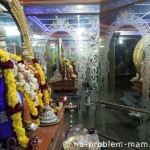 The Ekambareswara is one of the Pancha Bootha Sthalams, five Shiva temples each of which represents one of the five elements. 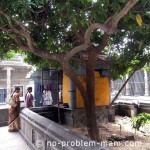 In this one, the sanctum sanctorum houses a Prithvi Lingam representing Earth (prithvi means “earth”). 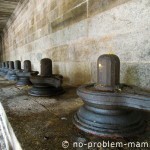 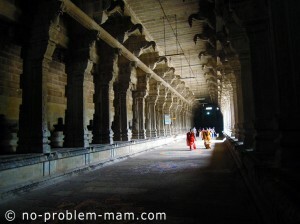 The hall with 540 pillars and 1008 Shiva Lingams is particularly impressive. 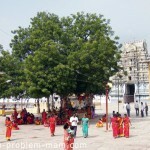 Another of the temple’s particularities is a mango tree said to be 3500 years old and to produce four different kinds of mango. 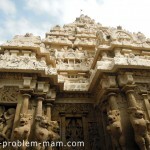 The stones themselves will tell you that the Kailasnathar is the oldest temple in Kanchipuram. 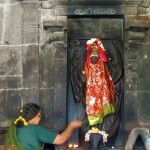 It is dedicated to the Hindu god Shiva (Kailasanatha means “Lord of Mount Kailash”). 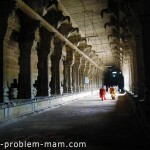 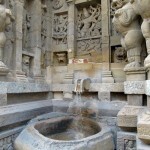 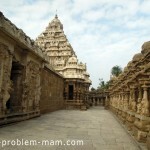 It was built in the late 7th century by kings of the Pallava dynasty. 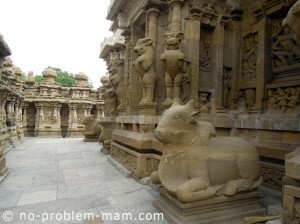 The sandstone temple is famous for its carvings of half-animal, half-human deities; these were popular in the Dravidian architectural period. 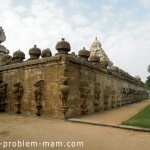 The outer wall has 58 small shrines showing different aspects of Shiva. 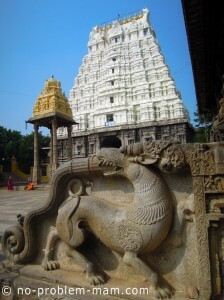 Varadaraja temple is dedicated to the Hindu god Vishnu. 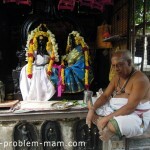 Varada means “dispenser of blessings” and raja means “king”, so varadaraja means “king who dispenses blessings”. 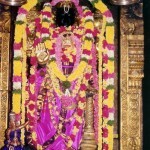 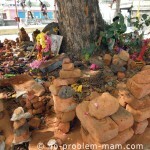 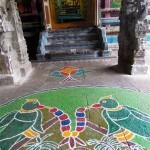 The temple is one of the Divya Desams, the 108 Vishnu temples mentioned by the 12 poet-saints or Alwars. 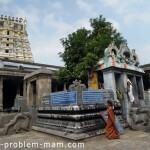 Varadaraja Perumal temple was built by the Cholas in 1053 and enlarged under subsequent rulers. 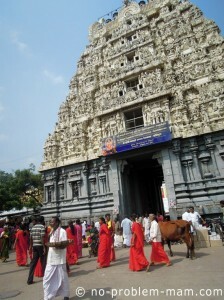 The immense complex covers 23 acres and consists of 32 shrines and three courtyards. 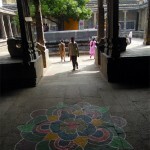 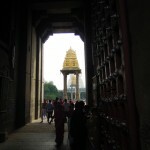 Unfortunately non-Hindus are only allowed into the first courtyard and cannot see the sanctum. 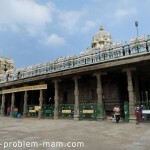 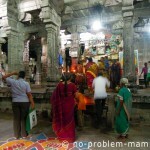 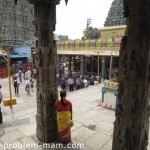 Kamakshi Amman temple was probably built by the Pallava kings around the 6th century. 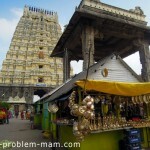 It is famous as a temple to Kamakshi, one of the forms of the goddess Parvati. 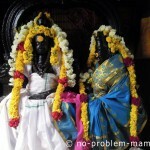 Kamakshi means “she whose eyes are full of love”. 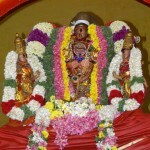 The goddess is seated in the yogic lotus posture or Padmasana, which symbolises peace and prosperity. 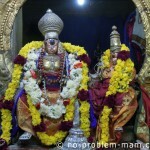 Kamakshi is also one of the 51 Shakti Peethas.